IELLO’s 8-Bit Box is a splicing of arcade gaming and board games, with controller-like components used to emulate cabinet inputs and a shared play-space in the form of the board, representing the screen. In what is probably the most pure fusion of earlier forms of gaming, IELLO’s upcoming 8-Bit Box manages to fuse together early gaming and board-gaming in a way which cleverly emulates synchronised, same-screen play while keeping the slower, observed, tactical nature of turn-based board-game play. 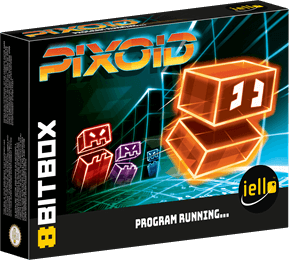 Pixoid, the first of the three games planned to be included in the core box, is an homage to Pac-Man. Including asymmetric multiplayer gameplay — one character racing around the grid while the others hunt them down. It’s easily the strongest example of how turns play out in most of the planned games, with each player analysing the playing field as it stands before tweaking the dials on their controller (secretly) to reflect their planned next move. Players then reveal their controllers for the turn resolution and act out the moves. While certainly a little disjointed in its removal of the frantic pace of the arcade title, the concealment and reveal of player intent adds a layer of both suspense and tact to the game. Where players in the arcade title were running on reflex spliced with mild foresight, reflex in 8-Bit Box’s Pixoid is instead populated with chess-like forward anticipation and calculation. It’s clever, to say the least. As it stands, the 8-Bit Box is definitely in the late prototyping stage, although it has already received a light showcasing while at the Nuremberg Toy Fair earlier on in the year, as demonstrated by IELLO’s Romain Francois below (via Spieleleiter). The above is very much a work in progress, with plenty of room — and time — for the design to twist and change. It’s a video well worth a watch, and Romain demonstrates how the controller-shaped devices have an almost Rock, Paper, Scissors reveal to them, which duplicates the turn-based nature of board games. As said in the video, there are additional titles planned for launch, and I must say that I’m especially curious about the Olympic/Winter/Summer-Games–style title planned for the system — the notoriously frantic titles have broken many a controller, or (more recently) snapped many an analogue stick, so it’s certainly a genre I would have placed quite far back when it came to listing off ones appropriate for conversion to a boardgame. The 8-Bit Box is currently expected to release before the end of 2018. We’ll hopefully be back with more details on it before then, though, of course. 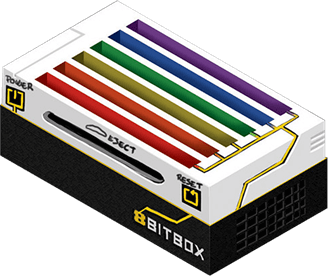 What are your thoughts on the 8-Bit Box? Are there any types of games you think would fit the concealed-move controller design in a clever way? Feel free to leave a comment below.